Why Do Interchange Costs Matter To Merchants? It matters because interchange is your acquiring bank’s biggest cost and will be passed onto you through your transaction charges, otherwise known as your merchant service charge (“MSC”) . It is payable by your acquiring banks to the card issuer on every card transaction processed. How much is the interchange “mark up” ? Who sets the Interchange rate ? It is set by the card schemes, albeit the income is received by the card issuer. How much is Interchange ? Country of origin of the card – tourist carry cards issued by overseas banks; these are more expensive than cards issued by UK banks. When switching, suppliers rarely quote all of the permutations of MSC rates unless you specifically ask – you usually are given one debit rate and one credit rate. Often the first time you will be aware of any differential is in your first statement and by then it is too late. The different rates will be noted on your contract but often these are difficult to spot as terminology such as “qualifying rate” and “non-qualifying rate” is used. 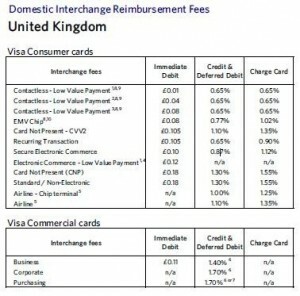 Visa and Mastercard interchange tables are published publicly (see below at February 2012). 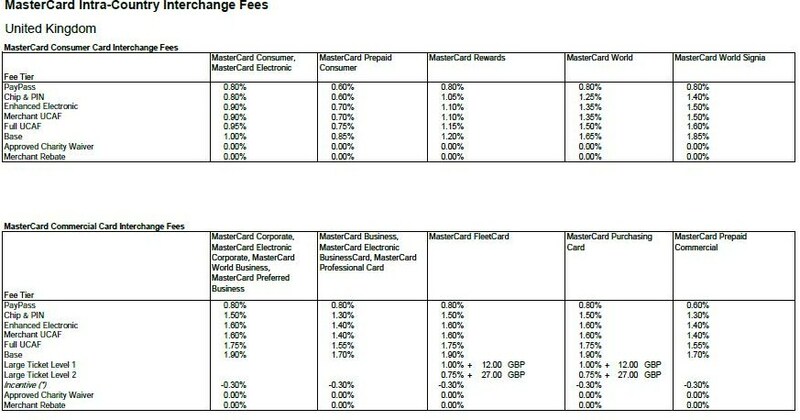 Mastercard and Visa Interchange rates are broadly the same (some minor differences) but for the purposes of illustration, the rates discussed below are Visa Interchange rates. Broadly, the interchange on a UK issued personal card processed using a chip and pin terminal is 8p per transaction for debit and 0.77% of transaction value for credit cards (refer “EMV chip” below). Interchange on online transactions and phone transactions is more expensive because these are cardholder not present (“CNP”) transactions and the risk of fraud or chargeback is higher. For example, a CNP transaction is 1.3% credit / 18p debit, which reduces to 1.1% credit / 10.5p debit if the CVV2 is used and reduces further to 0.87% credit / 10p debit if the secure electronic commerce system “Verified by Visa” (Mastercard equivalent is SecureCode) is used. Commercial Cards (or Premium Cards) also carry much higher interchange levels from 1.4% – 1.7% credit / 11p debit because the businesses to whom these cards are issued are considered a higher risk than individuals who carry personal cards. The Standard rate (Visa) or Base rate (Mastercard) is the default rate charged if the transaction does not qualify for any other rate – sometimes called the non-qualifying rate. It is the most expensive rate because it is the riskiest form of transaction. Your transactions might incur this rate if for example, your terminal was broken and you were using an old foil swipe machine to take a paper imprint of the card or if you failed to upload / poll your transactions overnight for several days. If you find you are paying an MSC premium for standard transactions, speak with your supplier immediately. They will often be able to immediately rectify the problem, saving you a considerable cost of standard rated transactions.